This page highlights Two High Crosses found in County Derry. They are: Camus, and Mullaboy. 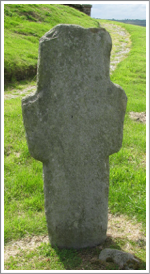 There are also Two Boundary Crosses at the Monastic site of Banagher. County Derry is located by the star on the map to the right. 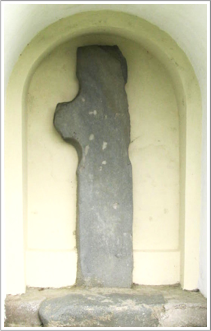 There is strong archaeological evidence for human habitation in what is now County Derry in the Neolithic and Bronze ages. 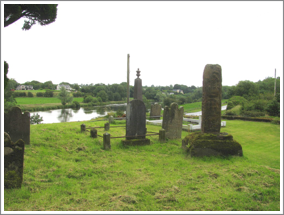 For example, Christina O’Regan, in an article entitled “A Monumental Discovery in South Derry”, reports on an excavation at the Brackagh sand and gravel quarry that revealed “a unique prehistoric burial monument.” (O’Regan p. 22) This in a landscape with court tombs, wedge tombs and stone circles. What is now County Derry (Londonderry) in Northern Ireland, was for many centuries, from at least the sixth century to the twelfth century, part of the Kingdom of Aileach. Aileach, referring to the kingdom of the Northern Ui Neill, included, at least most of, what are the modern counties of Donegal, Derry and Tyrone. 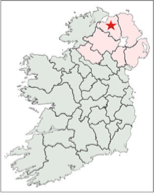 The two primary powers in this area were the Cenel Conaill and the Cenel nEogain. Both were descended from Niall of the Nine Hostages. Up to the eighth century the Cenel Conaill were dominant in what is now County Derry. This changed gradually during the sixth and seventh century as the two dynasties vied for power. As a result of the battle of Cloitech in 789, the Cenel nEogain won control of the kingdom. The shaft of the cross is about six feet tall and stands on a stepped base. The sides are decorated with designs. The East Face has scenes from the Christian Scriptures (New Testament). The West Face has scenes from the Book of Genesis in the Hebrew Scriptures (Old Testament). The following description of the images on the cross are from Harbison, 1992, pp. 30-32. It should be noted that Given quotes Fagan, writing in 1835, as identifying images of the Twelve Apostles on the Cross. (Given, p. 147) Harbison’s identifications are to be preferred. S 1: Design of interlinked C-shaped spirals. S 2: Fretwork and spiral bosses. S 3: “Two superimposed sets of rampant lion-like animals facing one another, the hind-legs of the lower two curling around into a spiral. S 4: A boss of interlacing. N 1: Fretwork ending in bosses. N 3: Interlaced quadrangular bosses. Getting There: See the Road Atlas page 4 F4. Located southeast of Coleraine. From the Stand Road Roundabout on the south side of Coleraine take the A54. About three km from the Roundabout the River Bann will be on your left and close to the A54. On the right you will see the wall of an old cemetery. Just past the cemetery take a right onto a minor road that will double back to the cemetery. 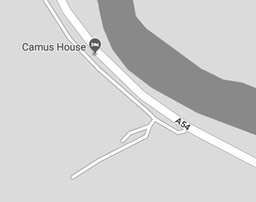 The map is cropped from Google Maps. Nothing is known of the origins of the Mullaboy Cross. It is said to have been moved to its present location in an old graveyard from a local garden. Ann Hamlin has suggested that a church site in the neighbouring townland of Killennan and the site of Seinlis Fort in this townland has led to the suggestion that one of the seven church sites attributed to St. Patrick in the Faughan area, Domnach Seinliss, was in this area. Whether the cross had its origins there is not known. (Williams, p. 148) The cross itself is undecorated and ringless. It is a little over six feet tall. The right or eastern arm is broken. The cross was carved with some care as the upper and lower corners on the left side, where the shaft and arms of the cross meet, are arcs of circles. Getting There: See the Road Atlas page 3, C5. From the A6, take the second road southeast of the B118 to the north. Keep to the left at the first fork then stay one this road till you come to another “Y”. Take another left and the graveyard will be on your left near the next “Y”. The location of the cross is marked by the blue star on the map to the right. The map is cropped from Google Maps. Banagher Church was founded in the eleventh or twelfth century by Saint Muiredach O’Heney. A chancel was added to the church in the thirteenth century. In addition to the ruins of the church there is a Mortuary House that is said to contain the remains of St. Muiredach. There are three holy wells nearby. Getting There: See the Road Atlas page 10, F1. 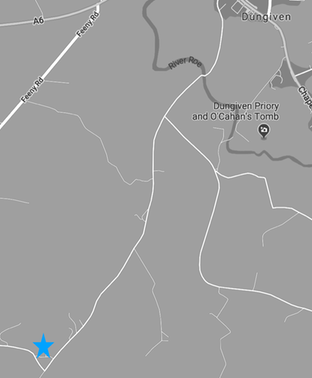 The Banagher Church is marked in the Atlas. It is located about 3 km south of Dungiven. The road from Dungiven to Banagher Old Church is the Magheramore Road. The map is cropped from Google Maps. 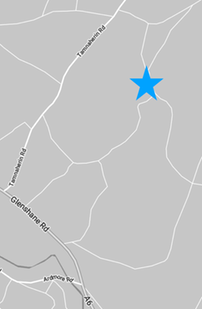 The location of the church is marked with a blue star. 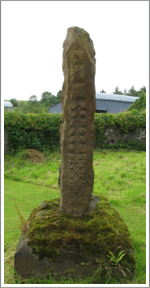 Given, Maxwell, “The High Cross of Saint Comgall at Camus-juxta-Bann, in the County of Derry”, Ulster Journal of Archaeology, Volume XI, October 1905, Number 4, pp. 145-152. Harbison, Peter; The High Crosses of Ireland: An Iconographical and Photographic Survey, Dr. Rudolf Habelt GMBH, Bonn, 1992. Volumes 1 and 2. Lacey, Brian, “Columba, Founder of the Monastery of Derry?, The Journal of the Royal Society of Antiquaries of Ireland, Vol. 128 (1998), pp. 35-47. 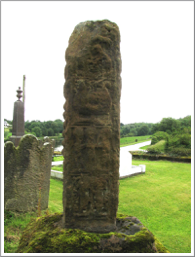 O’Regan, Christina, “A Monumental Discovery in South Derry”, Archaeology Ireland, Vol. 24, No. 3 (Autumn 2010), pp. 22-24.